Collaboration Space – a notebook for all students and the teacher in the class to share, organize, and collaborate during Mystery Skype. Content Library – a notebook for teachers to share Mystery Skype course materials with students. Teachers can add and edit its materials, but for students, the notebook is read-only. 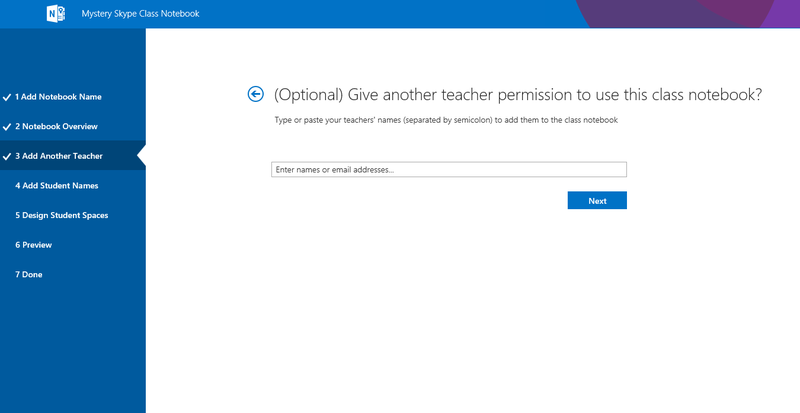 An Office 365 subscription for Education that includes SharePoint Online. If you're not sure you have this, please contact your IT administrator to verify. 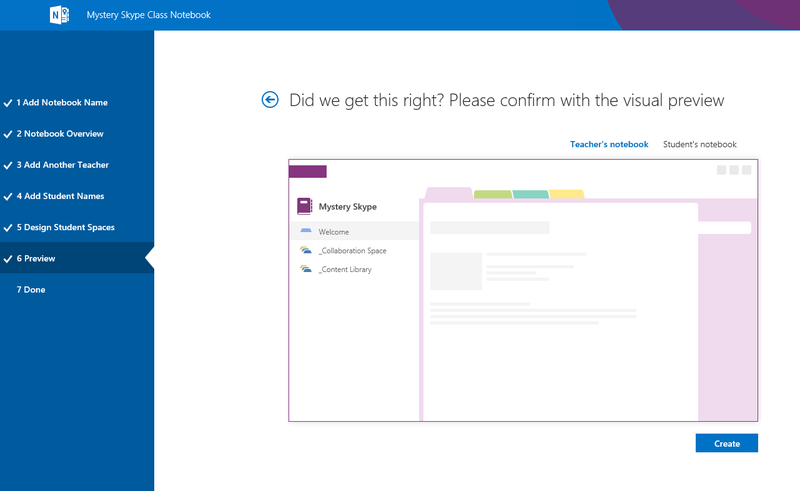 You'll need Internet Explorer 10 or Internet Explorer 11 to use the OneNote Class Notebook app. Other modern browsers should also work. Search for Mystery Skype Class Notebook in the Store. When the app shows up, click Add. When the dialog below appears, choose Continue. The app should now be installed in your My Apps page. 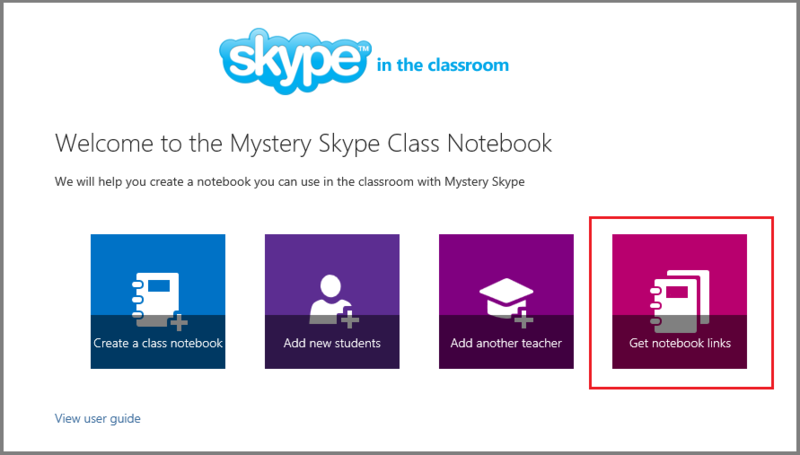 Tip: It could take up to 30 seconds for the new Mystery Skype Class Notebook to appear after you've installed it. 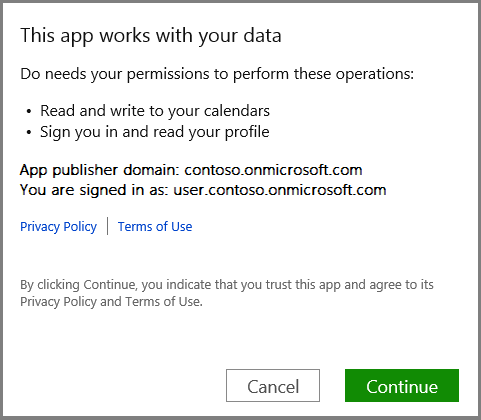 Click the app launcher icon in the upper-left corner of Office 365. In the App Launcher, choose My Apps. 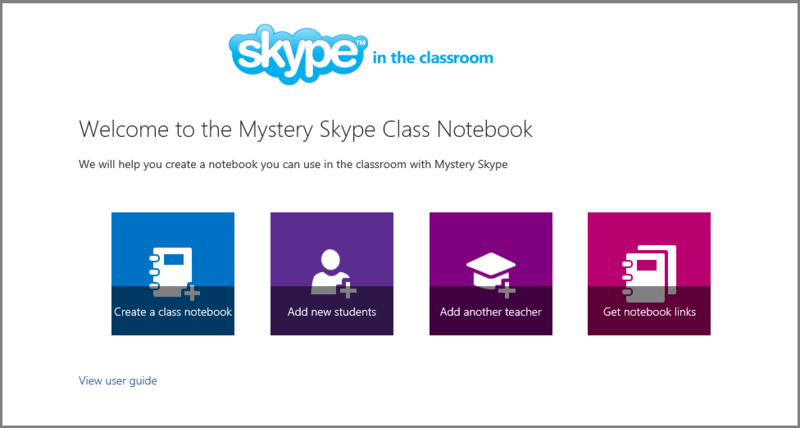 You'll see the Mystery Skype Class Notebook app in the list of apps available to you. Click the app go to the Welcome page. 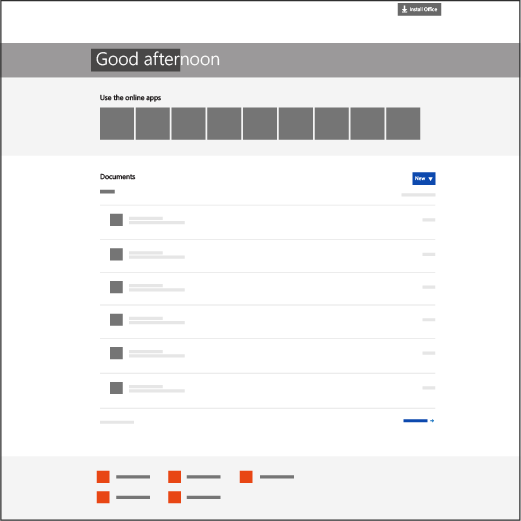 You can add your students individually or in bulk. Type a student's name in the text box, then press Enter. Repeat step 1 until you've added all of your students, and then click Next. 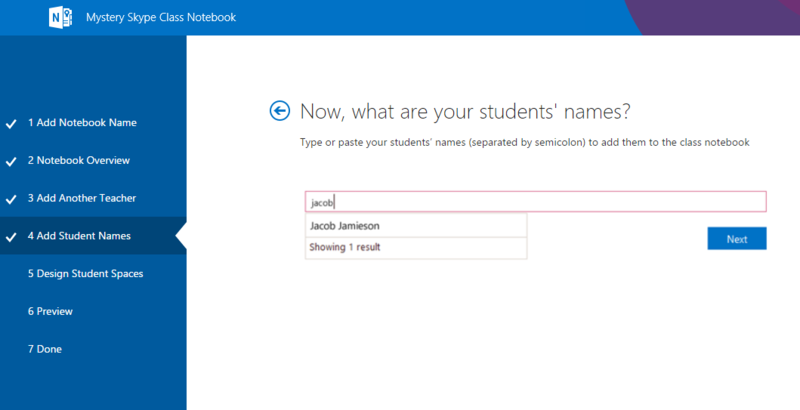 Copy and paste a list of the students' names, separated by a semicolon (;) into the text box. Tip: After you paste the students' names into the text box, the app will look up each name. The app may take a few moments to automatically resolve each name. For each match that isn't found, you can retype the name or remove the name from the text box. Click Next when you’ve completed adding all of your students for the class and the names have fully resolved. Keep the boxes checked next to the default Mystery Skype sections that you'd like created in each student’s notebook. Tip: We recommend that you create section names that correspond to Mystery Skype activities, not units. For example, use activities such as Research, Mystery Skype Jobs, What I Learned, and Reflections. Tip: You may wish to add content by placing it in the Content Library before inviting your students to open the class notebook. Keep a copy of the link in your records while you prepare the notebook, then share the link with the students when ready. To find any link to a class notebook that you have, simply launch the app and click the Get Notebook links button. This will bring up a page that has all class notebooks created by you and a link to each one. Select the link, press CTRL+C to copy it, and then paste the link into an email to your students.